It's difficult not start taking the crazy flips and contortions of the monks for granted. Everything seems so utterly natural, as if leaping through a series of backflips is as easy as breathing, a chilled out, relaxed and confident superheroism. There's an intense aura of control, grounded in a literal lifetime of training. 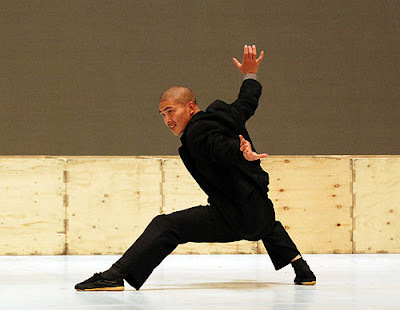 But this isn't some display of mere physical prowess: Sutra is about artistry, exploring Shaolin with a mashup of Eastern and Western sensibilities. 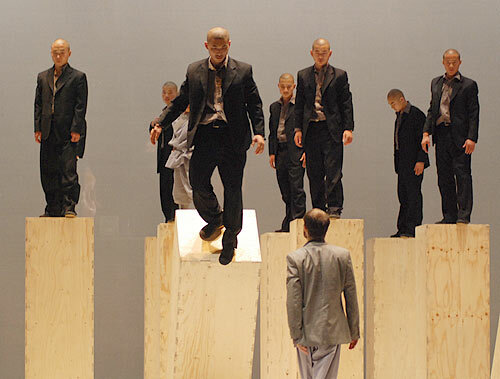 Sutra is the brainchild of Sidi Larbi Cherkaoui, working in collaboration with artist Antony Gormley, composer Szymon Brzóska and 17 monks from the original Shaolin Temple in China. Sutra is a wordless, plotless experience, billed as an exploration of the philosophy and faith behind the Shaolin tradition, how it relates to pop culture ideas of kung-fu and where traditional disciples like this fit into the modern mindset. The set design is attractively minimalist, a light grey background punctuated by 17 large wooden boxes, which transform into an apparently infinite variety of sets, from coffins, to cityscapes, to (most memorably) a slowly unfolding lotus flower. There is a sort of narrative running in the background, a Westerner, Ali (as played by Cherkaoui), is trying to comprehend the Shaolin philosophy. He's aided by a ten year old monk, who frankly seems to be put in some pretty dangerous situations for child performer. Shaolin shows are usually pretty popular in the UK, there's generally one touring the country at any given time. This one differs from the rest in that it's consciously highbrow. There's none of the 'test of strength' feats that you tend to see in other shows - no-one breaks blocks of concrete with their head or balances on the blade of a sword. But for all that Sutra has ambitions of high culture in its minimalist presentation, it's still in much the same tradition. This show treats these monks and their beliefs about as reverently as possible, but when you're watching religious ritual like this translated to stage for entertainment there's an inescapable whiff of debasement. The monks themselves are anonymous, seventeen acting as one with no individuality among them. Within the artistic context of the show this makes perfect sense; the show is an inquiry by a curious Westerner into their culture, but I find myself wondering about how they live their lives. The romantic side of me imagines them coming down from a cloud-capped mountain temple, experiencing the modern world as a series of bewildering, noisy kaleidoscopes and relying on their intensely training and spirituality to make sense of it. I suspect the reality is far more prosaic, I imagine them heading back into their dressing rooms, picking up their iPhones and checking if anyone's liked the cat pictures they posted to Facebook. But Sutra nudges us toward the romantic view - staging places them perched on top of wooden skyscrapers in business suits, being changed and trying to understand civilisation. This vision of the monks as unknowable, exotic superheroes is very attractive, with faint echoes of an obsolete, imperialist Orientalism that nonetheless remains pretty damn powerful. The perfection on stage is great fun to watch but also faintly unemotive. That's why, perversely, my favourite part of the show was one of the few screw-ups made by a monk. With the wooden blocks laid on end, the monks had to jump up and stand on top of them, looking down at Cherkaoui. One monk at the back just couldn't make it on top of his block - every time he jumped up the block wobbled and he fell off. After a few attempts, with all of this monk buddies proudly standing on top of theirs he retreated (presumably in shame) inside his box, out of sight. The empty plinth stood out like a sore thumb in the following scenes. I figure he was consumed with self-loathing as he stood, red-faced inside - his one job is to be an agile, ultracool Shaolin monk and he screwed it up. While I feel bad for him, the fact that it's entirely possible for them to screw up makes them much more human, and as far as I'm concerned much more interesting. For all that criticism I thoroughly enjoyed Sutra, and it worked very well within the context of the Wales Millennium Centre in Cardiff Bay. The show is a mixture of muted colours and plain wood, much like the magnificent building surrounding it. 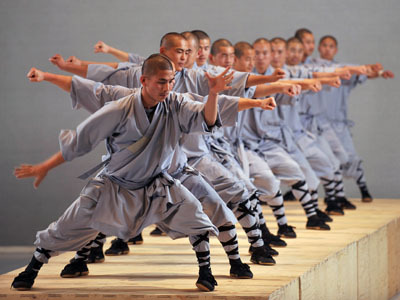 I doubt I'm ever likely to get bored of watching displays of martial arts; it demonstrates how insane commitment, effort and religious devotion can be translated into sheer beauty. The outstanding staging and music frame this beauty brilliantly, and it's difficult to see how someone could fail to be entertained by Sutra. At just over an hour long it's about timed perfectly, preventing boredom. Still, at the back of my mind linger worries that the simple act of witnessing a tour of martial arts of this kind dilutes it. In watching it, you become a kind of voyeuristic cultural tourist, appreciating the end product without any way to understand the ethos and mindset that it takes to achieve it. 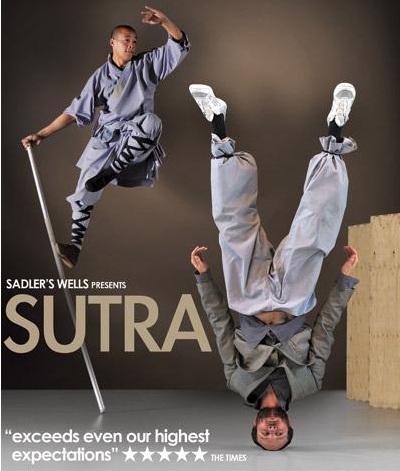 Sutra is being performed at Sadler's Well theatre on the 3rd, 4th, 5th and 6th of April. Tickets available here.